Whether you are new to the game of tennis or familiar, one cannot miss the obsession of this world famous sport. From reading about Serena William’s world records to the many positive fitness aspects of Tennis, it is a sport which makes waves on its fitness to a stylish dress code. If you want to get a dose of tennis, here are all the places in the city that are a must-try, regardless if you want to start as a hobby or get some serious training. An all-round space to sharpen your skills, Kineses is perfect for the beginner who wants to start with baby steps, or the rusty tennis player who wants to rework on his or her backhand strokes. No matter what your level, you are under the watch of Internationally certified coaches. If you just want to play a game and lack a plus one, a member of the team is always around to participate. From hosting a sports store, to being present in various locations across the city — Noah Tennis believes that lessons learnt in the game of tennis can also be applied outside the court — from teamwork to discipline. Catering to groups of all ages, their academy also hosts regular tournaments that put your skills to the test. With a national presence, this is where players are trained from beginners to pros. Whether you are in school or want a fun way to stay fit after the office, TAMS has a program for everyone and at every fitness level with a promise of training under experienced professionals. If you would like an activity filled weekend — they also have a ‘Play and Stay Program’ where you can stay at their guesthouses and resume a fun filled weekend of non-stop tennis. A company created by internationally certified athletes, Dhyan and Peter are reputed for their Tennis programs across the world. From coaching youngsters to players at tournaments, when you join their program you are certainly at an advantage. Apart from the coach, the academy also has an onsite sports psychologist and physical trainer to make sure you are conditioned as an all round champion ready to hit the court. A spacious centre with six tennis courts, along with a swimming pool, gym, yoga facility and more — the property also houses residential dormitories that are popular for their camps. Recruiting enthusiastic players of all ages, this is where training is seen as a process rather than a class. Also running day sessions, the courses are best suited for those looking to pursue tennis as a long-term commitment, with the option to train in tournaments. Hosting a range of programs all year round, there is something for everyone. From fun classes for kids, to practicing coordination movements for beginners and advanced players. The academy, also hosts women-focused tennis classes, and you can even hire your own personal coach. Apart from this, if you want to include tennis as a fitness routine more than a serious sport, then there is a programme to make sure you have your share of a good cardio and strength workout. An academy, that is inspired by international sports companies and based on a Spanish curriculum, Silver Strings offers affordable training programs. Whether you are a newbie to the game or want to advance your training, there are even courses for corporates that are created as a team building activity. If you would like to earn your coaching, try out for the Elite Coaching program that takes in participants based on merit and trains them under Spanish coaches. If you are thinking of becoming a coach, Silver Strings has a program that can help you develop the skills from beginners to training champions at competitions. Started by 12 time Grand Slam Champion — Mahesh Bhupathi, this is one of the many centres across the country. Specialising in coaching schools and children, there are also workshops and programmes for adults. Available at different levels, as per your familiarity with the game, expect nothing less than a intense training session. 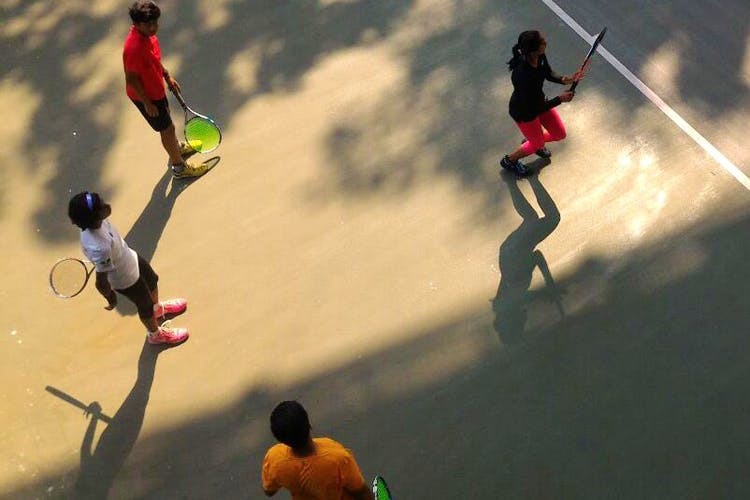 Located within the city, Bangalore Tennis Academy has dedicated programmes to coach you in specific areas such as tournaments and intensive training. Be prepared to set aside more than just an hour as your are trained by senior coaches who make sure you understand the technique and condition your skills in day long programs. This is followed by regular evaluations to make sure you are on the right track. When you train under coaches who were former athletes, you know that you are in good hands. For those just willing to get a feel of tennis, can opt in their beginner program, but if you want to train for tournaments then Topspin has the means to get you there. Creating a customised program, with a meal plan and personalised coaching, learn the A-Z of Tennis from technique to coordination skills.